SoftNAS Cloud is the flagship product that was presented at Cloud Field Day 4 by SoftNAS Inc. According to them, SoftNAS Cloud is a “data control and management” platform which enables companies to move their applications to the public cloud quickly. In doing so, they claim to have flexible solutions, ultra-fast transfer speeds and aim to avoid latency issues and outages. SoftNAS mentions being trusted by global companies like NetFlix, CocaCola, Salesforce, Toyota, Rackspace and many others so they already have a global presence. Apart from providing features that you would expect from any enterprise NAS product, depending on the edition, SoftNAS Cloud also provides some proprietary features that set it apart from others. I wonder if there could be a slide, summarising those features…. The team from SoftNAS was great and we had a very engaging session. I’ll start with a bit about the product and then go into some details and comments from me. 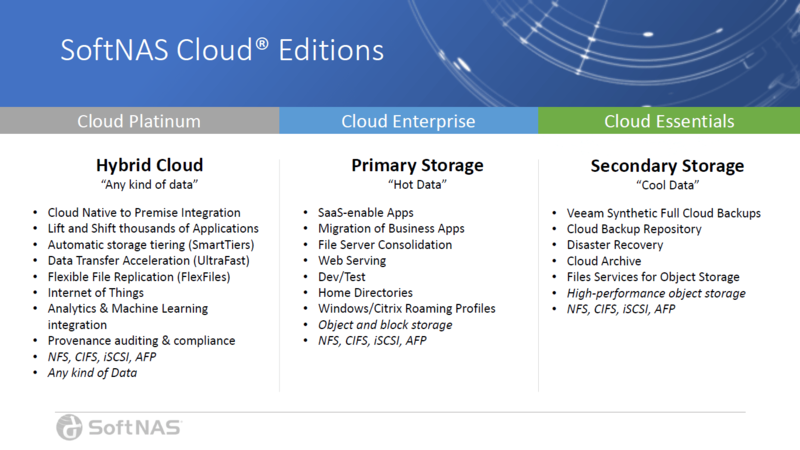 Most cloud products make their revenue based on editions and the features they provide based on that. SoftNAS Cloud is no different and comes in three different flavours: SoftNAS Cloud Essentials, Enterprise and Platinum. No prizes for guessing which one is the most feature-rich. Most features that we’ll talk about are included in SoftNAS Cloud Platinum and so that edition is what we’ll assume in this article. In simple terms, “Essentials” is mainly aimed at using the public cloud as a data storage mechanism whereas “Enterprise” enables public cloud storage for live data and applications as primary storage. Features from the various editions are cumulative so naturally, in addition to all the remaining features, “Platinum” also contains all features of the other two editions that precede it. In many places, SoftNAS Cloud claims to be a “Cloud-Native” solution. These days, it seems fashionable to use this terms liberally but it’s often misused. Having “public cloud focus” and/or porting a monolith appliance from a traditional virtualisation platform to a public cloud platform, backed by some public cloud-native feature e.g. object storage, does not qualify a product as “Cloud-Native”. This is not meant to be a lecture so I won’t say much but being cloud-native is about the application having a distributed architecture based on loosely-coupled components that can be modified and/or scaled-up (or down) seamlessly upon demand and are inherently resilient due to those capabilities. In fact, it doesn’t even have to be the public cloud really! It’s just that public cloud platforms tend to have the required mechanisms and scale available already. From what I’ve heard and seen so far, SoftNAS Cloud doesn’t fit my view of cloud-native. It doesn’t really matter to me that it’s not cloud-native as what’s more important is for it to do the best job of what it claims to do. I am sure the current architecture also helps with being quick to market on a particular platform. But the use of the term without merit annoys me a little. SoftNAS Cloud also claims to be able to “Control Any Data. Any Cloud. Anywhere”. Well, currently the only supported cloud platforms are VMware, AWS and Azure (with Google Cloud Platform coming soon). I know a lot of people who would disagree with the definition of “Any” here. I think support for a few more cloud platforms needs to come before the entitlement to use “any cloud” becomes acceptable. SoftNAS Inc. and the marketing department might disagree with me here and it’s not really my place to enforce what they can/can’t say. I do feel, however, that terminology should be used carefully so that they can’t be accused of unintentionally misleading customers. Cloud storage for a given region is shared between all customers so I/O performance can swing either way at any time and is, therefore, not consistent. The aim of ObjFast is to drive object storage as fast as it can perform at a given time by throttling back pressure and keeping the application alive by not letting it stall due to non-response from storage. SoftNAS say that the mechanism also learns storage behaviour over time and attempts to predict I/O performance based on history. My Thoughts: SoftNAS has clearly seen this problem being common in the wild and are, therefore, providing this solution. While I agree that driving object storage to its limits would create backpressure, I am not fully convinced that it’s a common problem. I think it’s more likely to happen due to regional issues, rather than users creating it but hey, I am not gathering that data. Anyway, assuming there is a problem, it would be a great solution to have this throttling mechanism in place. If you’ve seen the session, you may have seen me asking about “eventual consistency” nature of object storage as I would expect architects to take that those limitations into account and design accordingly. I was told that it does still occur and eventual consistency issue has also been dealt with by the algorithm that governs ObjFast. I am slightly sceptical of the algorithm being able to predict I/O performance over time and throttle accordingly. I am not too sure how accurate that prediction can be (as we’ll be relying on all other users of that storage to remain consistent in their usage patterns) but I hope it’ll provide at least some benefit. This feature is designed to save cost on cloud storage. It works in a similar fashion to tiering in traditional storage; the difference is that block storage (typically SSD) is used as the fast tier and object storage as the slower tier. As block storage is comparatively quite expensive, SoftNAS claims that storage costs can be reduced up to 70%. The use case for this is mainly applications where the I/O performance of storage isn’t quite what the application requires, forcing it to be moved to the more expensive block storage. SmartTiers aim to eliminate that requirement by front-ending the application storage with faster block storage but also reducing a significant chunk of cost by using object storage for the rest. SoftNAS has a SmartTiers Storage Cost Savings Calculator on their website for you to estimate potential savings, depending on the various factors. My Thoughts: It’s not clear to me if ObjFast (mentioned above) can be used with SmartTiers or not. It would be good if it can. In any case, without testing the product, especially against high I/O production workloads, I am unsure of how well it will work in real-life production environments. SmartTiers might enable the object storage to cope with the I/O demands but if you end up needing so much block storage to provide sufficient performance then it could become a case of “not worth doing”. Storage cost is typically the biggest item on a public cloud bill. However, just like storage cost itself, any savings also multiply quickly. Saving something is better than nothing so it can only be a good thing, especially if moderate/ low-performance systems are well catered for. I am hoping there will be sufficient guidance and/or hand-holding to plan this tiering carefully. This feature is SoftNAS’s patent-pending technology that enables accelerated data transfer between two SoftNAS Cloud Platinum nodes. Note that this (or other features in this section) are not available for other editions. This feature is pretty important for obvious reasons and also helps with data migration and continuous sync features. UltraFast aims to reduce packet loss and latency, especially on weak remote links. It enables replication of data from sites that otherwise would either not be able to sync to a central site (as it would never complete) or won’t be able to keep the data in sync in a timely fashion. SoftNAS claims that using this feature, traditional TCP based transfers can be accelerated up to 20 times, which if true, will be great for remote sites. My Thoughts: I don’t know if you’ve noticed the slide above that claims “20x to 100x faster than TCP/IP”. It could be a typo or could be true, who knows! It’s hard to believe that kind of improvement is achievable but even 20x could be a Godsend for companies trying to efficiently consolidate and backup their data. That, in conjunction with bandwidth scheduling options, makes it extremely attractive to companies as it enables them to transfer remote data but also take consolidated backups with effective use of bandwidth too. Like all networking situations, performance claims can vary depending on many variables so I wouldn’t rely too much on it yet. However, if you do have this problem, I guess it would be quite easy to deploy a couple of instances and try it out yourself. Not directly a storage feature, FlexFiles has more to do with evaluation and transformation of data. Suppose you have a set of data and you may not need all of it to generate what you require. Typically, you would send all of it for processing (if it’s on a remote site) and once across, filter and transform the data using some application. My Thoughts: While this could be quite useful to those who need it, this seems to me more like a value-added feature. Don’t get me wrong, I would rather have a feature than not but I don’t think this would cause me to buy the product itself. Also, one of the main benefits is to be able to filter and dump the bits not required at the origin. That’s very useful if the source site is remote but not so much if it’s not. The appliance deployed into the public cloud platform is still a compute instance, just like a virtual machine. Naturally, it will require a certain amount of resource, depending upon the workload. In a high-availability setup, it would be twice of whatever the cost is. It’s easy to forget infrastructure costs so if the appliance is going to stay up all the time, I thought I should mention it. SoftNAS makes the 30 Day free trial available to you. So download and test the product thoroughly to see exactly how it behaves on the infrastructure and with the connectivity you have. That way, you can be sure and/or iron-out any issues in liaison with SoftNAS support before committing to the product. There is also the Developer Edition which is permanently free. The only limitations are 250GB of data storage and absence of a high availability deployment. It’s fully-featured otherwise so a good option is to keep one running constantly to test against. Clearly, it’s not meant for production but a great way to test most of the functionality. There are still many organisations where there are plans to move to the public cloud but if the discussion goes beyond having more than just another backup location, they get stuck planning and worrying about the migration of their applications. They’ve been comfortable with their well-known storage/protocols and retraining staff before the move is made, is seen as a major risk. They need a product which abstracts all that complexity out of their migration and provides them with storage that is fast, secure, available in the cloud near the applications and with all those familiar protocols. SoftNAS Cloud fits the bill perfectly. It not only provides the familiar protocols to work with so that the applications don’t have to change but also keeps the data in sync during migration, due to its optimised data transfer mechanisms. It could unlock that migration door for such organisations and enable them to focus more on other technical aspects of the migration, rather than data storage and its security. While there are many benefits to moving to the cloud, unfortunately, cost saving is seen as the primary reason for it. When that saving is not achieved, the whole project is seen as a failure. Hopefully, SoftNAS Cloud can help reduce those storage costs while maintaining performance, thereby making the migration a success. SoftNAS Cloud also provides the same solution on multiple clouds (hopefully more support soon) which reduces complexity and eliminates the learning curve associated with different cloud storage types. I think that is one of their major selling points that needs to be more visible on their website and promotional materials. 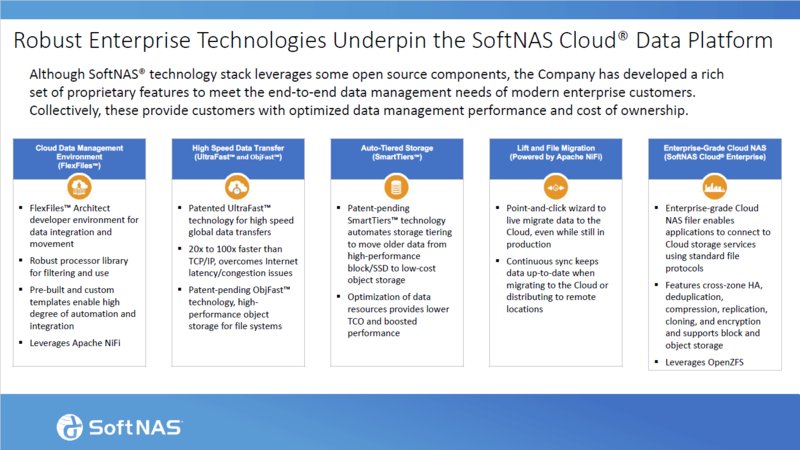 In the days of hyper-converged storage appliances (that are also starting to provide their multi-cloud integrations), SoftNAS Cloud can still stand up as a solution that can fit any scale as companies only pay for the size they want. This means low starting footprint/price point and for some organisations, it’s a major advantage when starting on their cloud journey. I am a big advocate of cloud-native architectures but I am also aware that it’s not suited to or required by many organisations. They don’t want to rearchitect their applications and for such organisations, SoftNAS Cloud is the perfect solution. [Update 28/08/2018 21:40 BST]: Updated “Testing” section in light of confirmation from SoftNAS Marketing that “Developer” edition is fully-featured, apart from the limitations mentioned. Hi Ather, thanks for the fair assessment of SoftNAS Cloud! Just as a point of clarification, SoftNAS Cloud Developer Edition IS fully featured with all of the SoftNAS Cloud Platinum features. The limitations are as you mentioned above: 250GB limit and no high-availability.